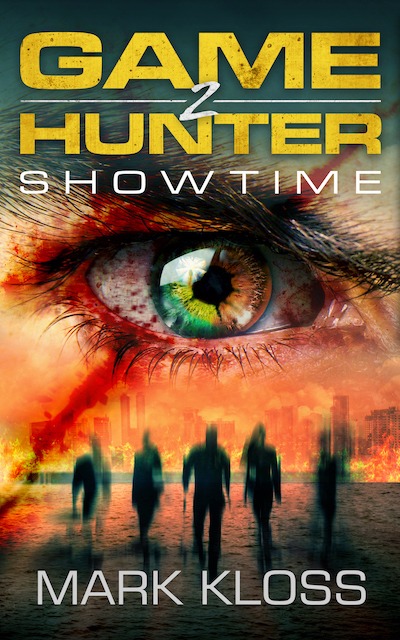 HomeMy BlogPostsGame Hunter Book Two, Showtime – is now out! With today being the exciting release day of my second Game Hunter book, I thought I would share a few of my thoughts that went into writing Showtime. Game Hunter One introduced the zombies, the main characters, the paranormal situation they found themselves in, and the terrible reasons behind it all. It all also built up to the moment when the Game Hunter company were ready to begin the first in a series of three deadly shows that would be played live on TV within the dark dystopian City of London. Therefore, I decided to get the first game going fairly early in the book. And it actually takes up the vast majority of Game Hunter 2. That is why I titled the book SHOWTIME. When writing these Game Hunter novels, I like to keep several things going: pace, savage excitement and humour between (I hope) interesting characters; with a few twists and betrayals to keep it interesting. The idea of a world-wide TV audience enjoying watching these zombie game players struggling to survive, or perhaps even win, these brutal games of death and betrayal is fascinating to me. I believe there are lighter echoes of this within our own society, and I sometimes wonder how much further we have to go for fiction to become fact. The City of London is an ancient segment of lived upon land through which the great river Thames flows. Once night returns, the people leave and the mysteries grow, the ghosts awaken to walk the dark alleys and visit their fellow spirits in the old pubs and medieval buildings. Well okay, maybe I just got a little carried away as a writer can tend to do… but I can’t fully believe nothing at all happens in those dark quiet hours before dawn returns. I enjoy playing with these paranormal possibilities. I’m a firm believer that the life blazing within each one of us makes us who we are. Each of us different, each with our own personality, desires, loves, and strength of mind. I believe it is a spiritual question, not a mechanical one. For example: does our burning life come from within our very soul or is it from our brain cells? Questions that you will surely provide the answer to. In Showtime you see both the degraded and shining side of man and zombie. The pace is relentless, and death is a way of life in this prison city. However, like a flower’s determination to grow in an inhospitable desert, humour, romance and fellowship still finds a way to break through. Thank you in advance for reading my book, I hope you enjoy it. I would love to get feedback from you once you have finished.